Bulky HOSP nest, probably from multiple broods. Nest description: Loose jumble of odds and ends, including coarse grass (with seed heads), cloth, feathers, twigs and sometimes litter (e.g., clear plastic, cigarette filters). 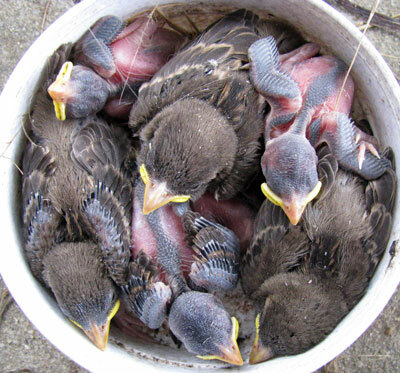 Mid-summer nests sometimes contain bits of green vegetation (mustards or mints.) 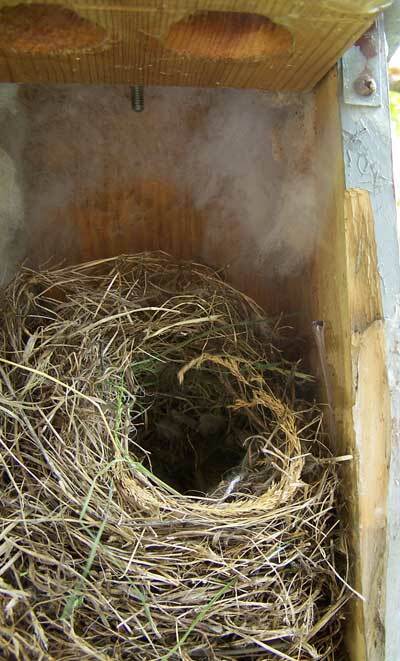 Tall nest, often with tunnel like entrance, particularly when built outside of a nestbox. 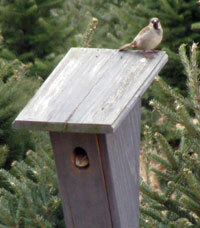 In a nestbox may have more of a cup shape, and may be built up to cover sides of box. See more nest photos. Eggs are cream, white, gray or greenish tint, with irregular fine brown speckles, shell is smooth with slight gloss. See more photos. The background color can vary, the color of the spots can vary, the thickness of spotting can vary, and the size can vary. 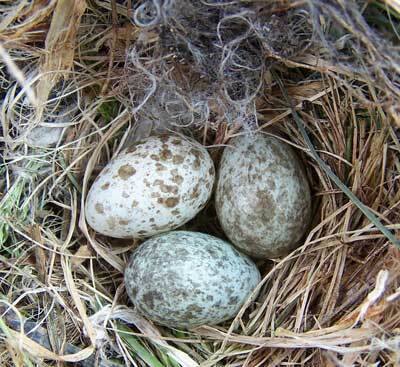 House Sparrow eggs are sometimes confused with Cowbird eggs, but typically there would be only one Cowbird egg, and the rest would belong to the host. 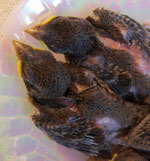 More on cowbirds. 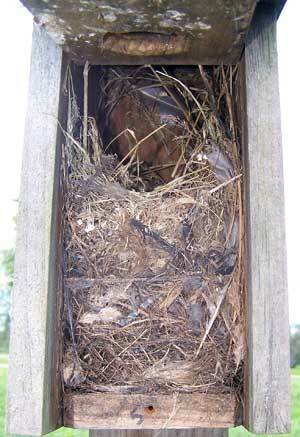 House Sparrow nest in a Two-holed Mansion built by Linda Violett from my no-trap Hill Trail. Photo by Bet Zimmerman. 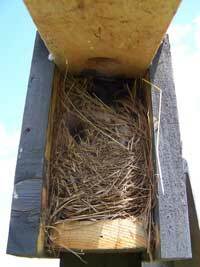 Notice tunnel like entrance that I do not usually see inside smaller nestboxes. 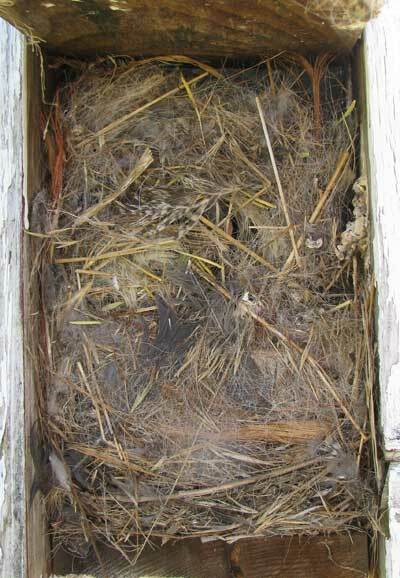 A typical HOSP nest in a NABS box below.This one was a takeover of an Eastern Bluebird nest which makes up the lower part. A House Sparrow nest in WA. Box has been flled right to the top, possibly multiple nests piled up. Lots of feathers. Zimmerman photo. 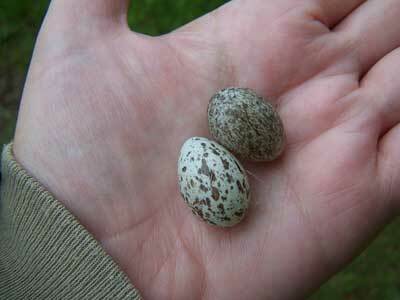 These two eggs were found in one nest (H-11 on 05/19/07). Notice the difference in marking. 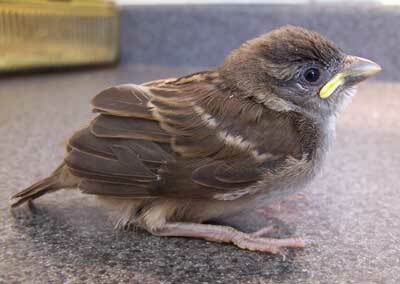 NOTE: House Sparrows are non-native invasive pests, and are not protected by law. 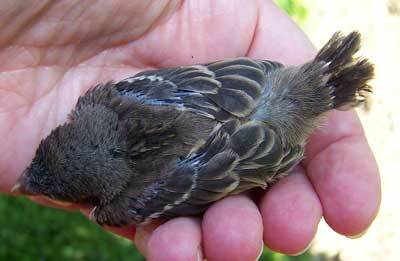 They will attack and kill adult bluebirds (sometimes trapping them in the nestbox), and destroy eggs and young. 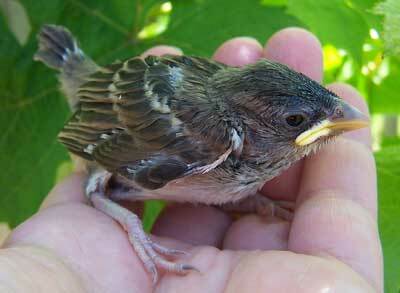 In the U.S., House Sparrow nests, eggs, young, and adults may be legally removed or destroyed. It is better to have no box at all than to allow House Sparrows to reproduce in one. HOSP eggs from the Hill Trail - again notice variability in coloring and markings. Makes me wonder about egg dumping. 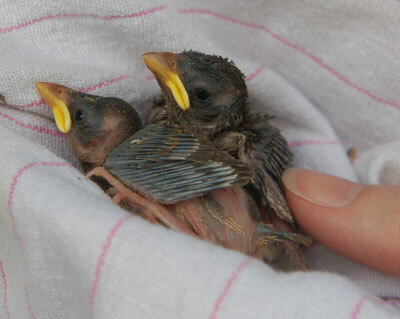 These HOSP nestlings in Southern Caifornia are very different in size. This may be because the eggs started developing when the first egg was laid, since it was so hot that August. 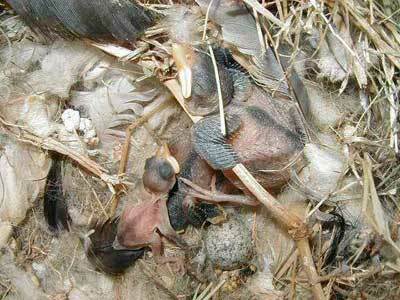 An unhatched eggs egg is below the large chick. Photo by Linda Violett. HOSP nestlings of various ages (from three separate nests.) Zimmerman photo. 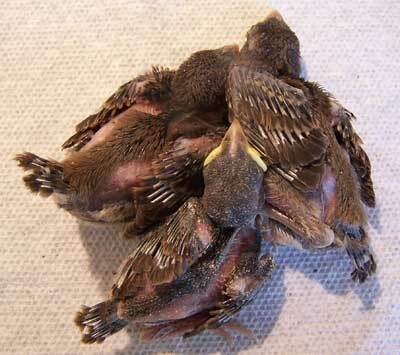 House Sparrow nestlings, age unknown. Photo by Bet Zimmerman. Young nestlings, photo by Vanessa Voisinet. Their pin feathers are almost blueish. HOSP nestling. Age unknown. Remember these young will quickly (in 4-9 mos.) grow into breeding adults. The color in this photo is closer to reality than the ones above and below. Could possibly be confused with Great Crested Flycatcher young from the back.